Oh, it’s been a busy time, my friends. Following my editor’s remarks on the first draft of my new book, I’ve spent the last few months performing a massive rewrite (“performing” seems like the correct word, as it sometimes felt like a surgical procedure.) In addition my proverbial day job has kept me busy, and of course there are always the eternal joys of ferrying my children between music lessons, summer basketball practice, and the swimming pool. And, oh yes. In May I got married. Well, no more. 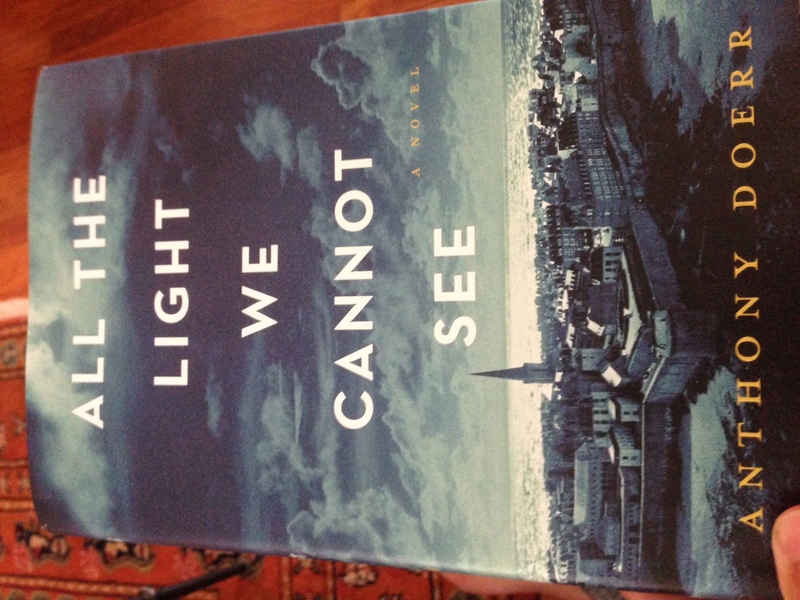 I delivered the revised manuscript to New York last week, and without the pressure of all those words bearing down on me, I have treated myself to ALL THE LIGHT WE CANNOT SEE, by Anthony Doerr. It’s a wonderful read. 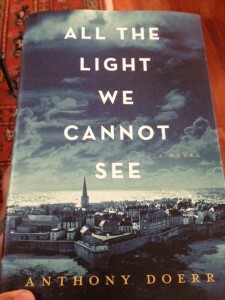 Set in France during World War II, it could not have been more in my proverbial wheelhouse. It’s a thrilling novel, gorgeously evocative, fantastically well-crafted, and beautifully paced. It’s selling by the truckload right now, and it’s easy to see why. I highly recommend it. It’s also 530 pages long, and I read it in three days. It was such a joy to be able to immerse myself in a book so completely. I just sat on the sofa and read, moving only to make more coffee and walk the dog. One forgets how different an experience that is to the more usual snatches of a few pages here and there. It’s particularly rewarding with a book like Doerr’s, which does such a good job of taking the reader into an entirely different world. Inevitably, the manuscript will land back on my desk before too long, with more revisions required, more edits to consider. Until then, though, I’m looking forward to a lot more guilt-free immersive reading. What was the last book you thoroughly lost yourself in? Immersive sums up ALL THE LIGHT WE CANNOT SEE very well. Without hinting at any spoilers, I lost myself in the book. I was so into the moment and time…so much so, that some things at the end almost seemed jarring. I spent a day or so rolling it all around in my head until realizing it’s perfectly written and handled. I just loved the experience of getting lost in the mood and prose and everything else that I wanted to stay there. I read it a couple weeks ago, and it’s still the book in my head — even though I’ve read another since then. I hope you find more time for reading, and I look forward to your next book! Yes, reading is key to everything, and yet I seem to have piles of books around that haven’t been read. The last book? One you recommended. ALL THAT IS (James Salter). He is so original and attuned to the smallest perception and experience. He breaks rules, and I always like that. Now I want to dip into a book that has gotten a very good review in The Atlantic Monthly: THE NOVEL, A BIOGRAPHY (Michael Schmidt). It will be kind of like reading a fascinating encyclopedia, I’m guessing.